Numbers are weapons when put in the hands of Ontario’s parsimonious premier Doug Ford. The leader of the PC majority party at Queen’s Park has been on a cost cutting mission since his election in last June’s provincial vote. Earlier this year he turned his guns on the $58 billion healthcare funding (2017-18 figures) which makes up a disproportionate 40-plus percent of the provincial budget pie. The last provincial regime under former premier Kathleen Wynne projected a 3.2 percent increase in costs for 2019-20, which was far too rich for Ford’s liking. Those numbers are not sustainable, he insisted, and at the end of February, he introduced the far-reaching Bill 74, the ‘People’s Health Care Act.’ This will create a super agency to absorb many of the local LHINs (Local Health Integration Networks), along with other networks including Cancer Care Ontario, and e-Health Ontario, among others. The goal is to find efficiencies, and cut costs, dramatically. Only months after winning the June 2018 vote, he proposed cutting $300 million in funding for mental health across the province. NDP leader Andrea Horwath with the three Brampton NDP MPPs at Tuesday's healthcare town hall meeting. On Tuesday, NDP leader Andrea Horwath and her three Brampton MPPs, deputy-leader Sara Singh (Brampton Centre), Kevin Yarde (Brampton North), and Gurratan Singh (Brampton East), gathered before a full house in Brampton and, for over an hour, fielded questions and listened to stories of people who have suffered serious illness and were forced to lean on the broken healthcare services offered to them in the city. The ongoing crisis here could get worse under Ford’s heavy-handed, efforts to cut costs. His government has already chopped funding to the arts, autism services, university expansion, has cut Toronto council, and, according to Ottawa, has held back federal dollars targeted at infrastructure fixes for municipalities. The Ford regime is deep into discussions which could potentially lead to lopping off the fourth-tier of government (regional) across the province, including Peel. There are other numbers that have the PC party’s attention, especially the aging population. In 2015, the Baby Boomer demographic, those 65 and older, passed a significant milestone. Residents now considered seniors exceeded the number of children 15 and under – and now more than 6 million Canadians fall into the rapidly growing cohort. Its 3.5 percent growth rate is four times higher than any other age group, and recent estimates say the province’s senior population will double by 2030. Aging people need more healthcare needs, and long-term care services are rising at alarming rates, putting more pressure on the government to get a grip on its funding. It’s a valid concern, and if Ford’s government finds some solutions they should be credited for doing so. But for now, putting efficiencies over people’s lives before we know what the actual long-term benefit might be, has drawn the ire of the provincial NDP under Horwath, who, channeling her best Tommy Douglas (the father of the NDP and universal healthcare in Canada), held the special town hall meeting this week at Greenbriar Recreation Centre on Central Park Drive in Brampton Tuesday night. 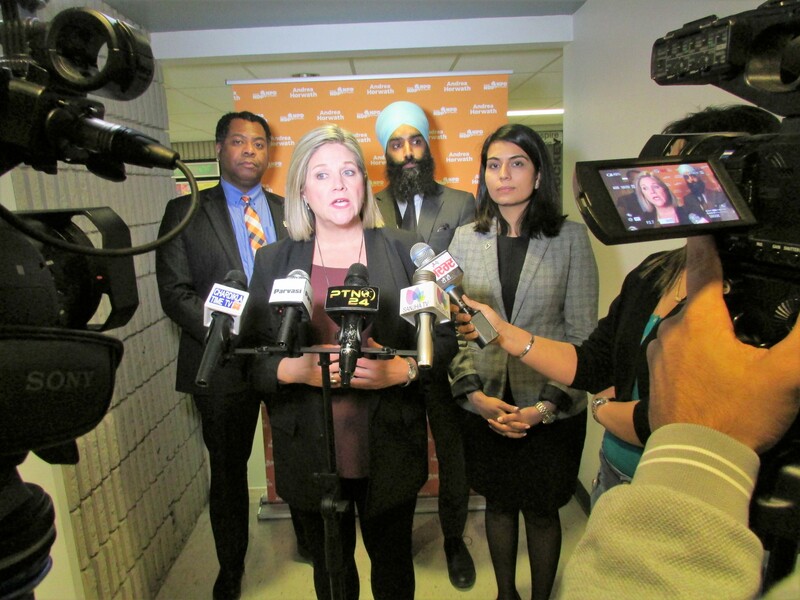 Horwath told The Pointer it was a chance for local residents worried about a dire lack of proper healthcare in this city, to vent their frustrations and meet with a party that wants to stem the tide of underfunding. The NDP has been particularly critical of the PCs and the overcrowding at Brampton Civic Hospital, part of the William Osler family of facilities. The City of Brampton has had a staunch advocate in Horwath over the years. It was the NDP, ahead of last spring’s election, that revealed ministry of health documents showing 4,352 patients at Brampton Civic had to be treated in hallways and other makeshift spaces over a 12-month period, ending in April of 2017. She then moved a motion that was passed with the help of the ruling Liberals to send $30 million of emergency relief to Brampton Civic to open up more space for use inside the hospital. But the Liberals later reneged on the commitment. Horwath introduced a motion in the legislature last October to open a new hospital in Brampton, but it was killed by the Ford PCs. The initiative might have come from the two sitting Brampton MPPs in the Ford caucus, Amarjot Sandhu (Brampton West) and Prabmeet Sarkaria (Brampton South), but towing the party line seemed a higher priority with them, than servicing their constituents. Neither PC members even bothered to show up to vote on the motion, or engage in any meaningful advocacy to drive forward a plan to solve the city’s ballooning healthcare needs. While claiming the city’s ongoing healthcare crisis is a priority for them, Sandhu and Sarkaria have done nothing at the committee or legislative level to advocate on the issue, and were confronted by angry residents earlier this year at a public Brampton gathering to address the dangerous overcrowding inside Brampton Civic. They showed up 45 minutes late to the event. While parliament did approve the idea, it’s on the provincial level that costs for care fell, and Canada’s shining jewel of entitlement has come with a very high sticker price. The total cost of healthcare across the country doubled to $200 billion between the years 2000 and 2011, and the costs have continued to rise. The majority of that money is eaten up by hospitals. There was broad consensus at Tuesday’s townhall that Brampton Civic is criminally overcrowded and Peel Memorial Centre for Integrated Health and Wellness, a facility designed for a more preventative approach to medicine, isn’t cutting it as an adequate second healthcare option, largely because it was created with a different philosophy in mind. It’s unclear when we will find out how it’s benefiting the community and who is taking advantage of it. Horwath said decades of hospital budget cuts and funding freezes have only made problems worse over the first year of the Ford regime. The day Brampton Civic opened “it was over-capacity,” she said, and during her presentation, she often referred to it as ‘Code Gridlock’. More than 4,300 patients were treated in the hospital’s hallways between the spring of 2016 and 2017, an average of roughly 12 people each day. 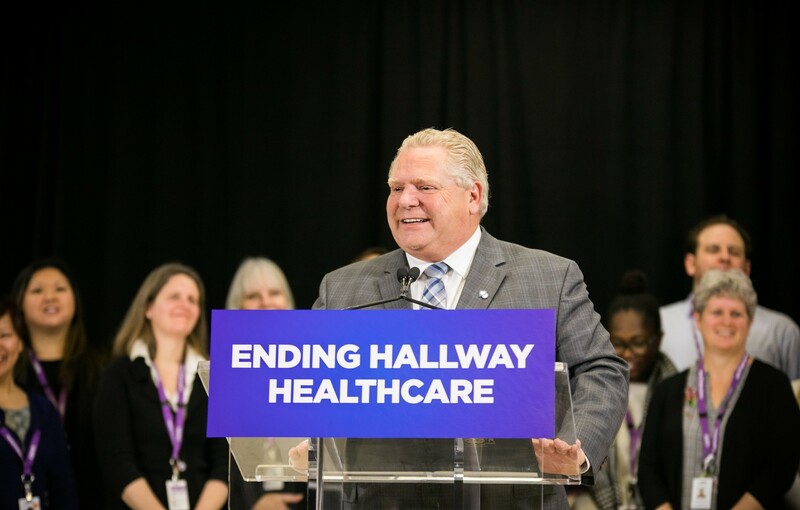 It’s a situation known internally as “code gridlock” and Brampton’s dangerous plight popularized the use of “hallway healthcare” during the last provincial election, a term Ford is fond of using. Last year, the Ford government announced it was taking action to end “hallway healthcare,” pouring $90 million into opening up 1,100 temporary beds at hospitals in five jurisdictions across the province. The idea was to help the communities during the worst days of the flu epidemic. 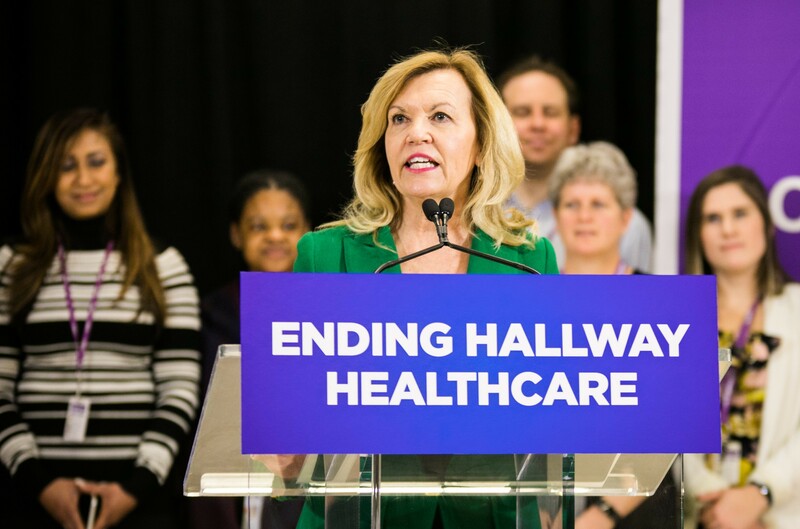 Surprisingly, Brampton, the home of “hallway heathcare” was not one of the communities picked for Ford’s plan to address “hallway healthcare”. Horwath and the NDP are calling on the Ford government to hold province-wide consultations on their new healthcare scheme but, so far, the premier has balked. Horwath said her vision for Ontario’s healthcare is not just about expanding space — but Medicare itself. The idea is to include prescription medication and dental care, while shoring up cuts to coverage that have taken place over the last decade. 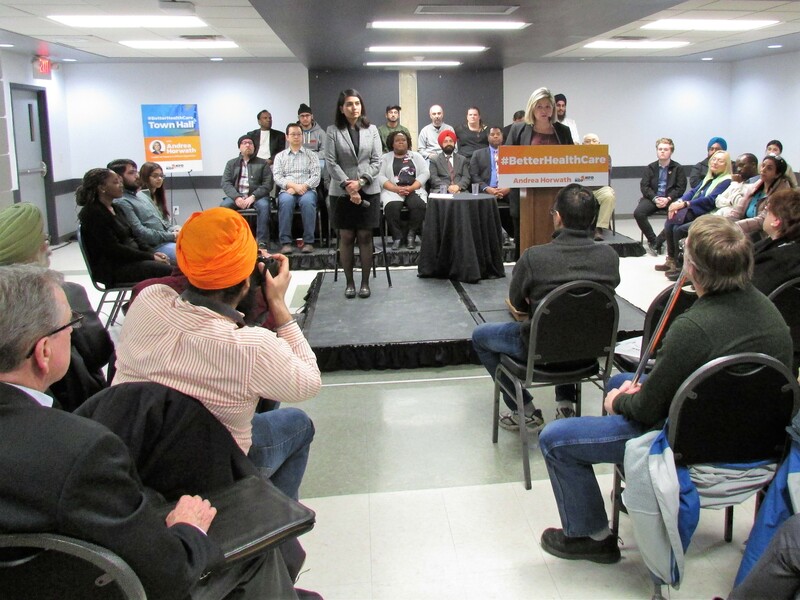 Brampton was only one of the stops on her own town hall, cross-province tour. Yarde renewed his assault Tuesday night. He is also hoping to organize a “Brampton Day” at Queen’s Park this summer so he and his colleagues can show the Brampton public concerned with healthcare around the legislature, and discuss the issues. The idea is to stir up grassroots interest in finding better funding formulas. His “Day at the Park” plan follows word from a senior official at City Hall that a special website is being created to advocate for healthcare fixes in the city and highlight the dangerous situation that’s been created by a lack of fair funding for the city’s healthcare needs. It’s hoped that the public will eventually take their own message to the overseers in the legislature. The Ford government is ignoring some rather blunt Brampton numbers. The city’s 600,000 plus residents receive only one bed for every 1,000 citizens, while the provincial average is 2.3. 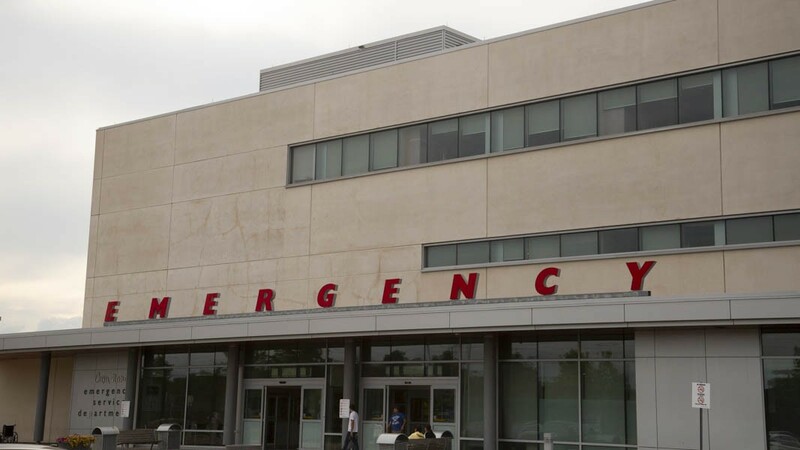 When Brampton Civic opened in 2007, its ER department was projected to funnel through 90,000 patients annually. The day it opened, it was over-capacity, and by last winter, the number had climbed to 378 daily patients. In 2017, the ER department had over 138,000 visits making it the busiest in Ontario. Oakville with 200,000 residents opened a new hospital in December 2015 with 457 beds. Brampton Civic serves a city of 600,000 with only 608. It doesn’t help that the city is one of the fastest growing in Canada. 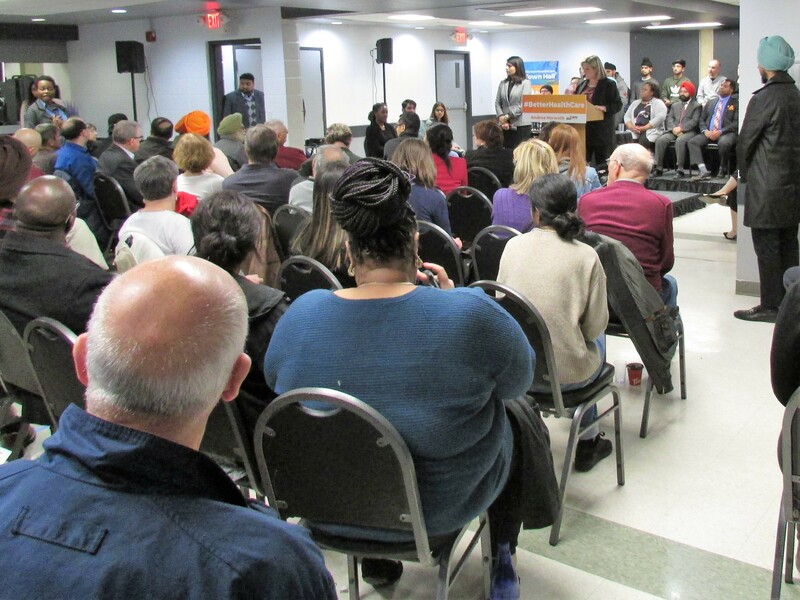 While Brampton Civic received most of the air time from Horwath and public speakers at Tuesday’s town hall, Singh said she has a soft spot for the new Peel Memorial site, and in an interview afterwards, expressed her concerns with what is happening there. She wonders why its preventative medicine model (it was built to be a patient-friendly and cost-effective way to increase outpatient capacity and promote community health and wellness) didn’t receive Phase 2 funding from the province. It’s an outpatient hospital, which does not provide overnight or long-term beds. Singh was born at the old Peel Memorial Hospital 34 years ago. The product of WG Davis Public School, Turner Fenton and Cardinal Leger high schools, she insisted the ‘preventative medicine’ model is a good one, but needs more government support. The care model to keep people at home to recover, eases a serious strain on the system, and will, if followed through, save the province money in the long run. Not only does Phase 2 need to be finished, but a third hospital is a must for Brampton, she said. Singh was happy with the large outpouring of concerned citizens on Tuesday, and their emotional messages calling for more coverage not extreme cost-cutting, is proof, she said, that healthcare shouldn’t be a negotiating tool. The potential move to a more privatized system, cuts to the core of what it means to be Canadian. Ford’s $330-million slash of mental health funding is particularly cruel, and counter-productive, says Horwath, taking a serious health crisis from bad to worse. “This signals that something is very wrong with this government,” she told the crowd. These cutbacks will simply take more people out of the system at a time when anxiety levels have been heightened. We’re falling backwards, she said. She said the government’s mental health commitment – $1.9 billion over 10 years, down from $2.1 billion over four years – is a massive and misguided cut, and will have long-term effects within the school system, and at post-secondary institutions. She said that resources for secondary and post-secondary mental health-related needs are already woefully inadequate and could also face further cuts under the Ford government’s plans for both levels of education. The PCs state firmly that costs can’t be maintained at the present level, and again it gets most of its ammunition from the numbers. According to a National Health Database, healthcare costs in Canada ate up 7 percent of Gross Domestic Product in 2007. That jumped to 11 percent last year, or $6,839 per Canadian. That number is slightly lower in Ontario ($6,584), but the total cost across the land is almost $254 billion. Yarde said the impact before the PCs were elected, was no good under Kathleen Wynne’s Liberal regime, either. The PCs have denied this and it remains unclear how the NDP’s claims of privatization could be realized within a system that is simply not built to accommodate a private model, other than for healthcare services that have traditionally not been part of the public system. The type of privatization being criticized by some would demand a dismantling of that system. However, the NDP have only zeroed in on certain types of support services, perhaps lab-work and even some diagnostic testing, which might get contracted out to future private providers. All of it remains speculation for now, and if the PCs are moving in that direction, they would have to weigh the political risk of any erosion to universal healthcare in the province. The town hall included young children, high school students, a woman fighting through cancer treatments, and many representatives from the 65 and older demographic. They represented Brampton’s diverse makeup. Those who spoke, did so passionately, and the overriding theme was Brampton has to get its fair share of healthcare funding. The stories shared with Horwath and her three Brampton-based MPPs, aren’t new ones.